There are worse things than weird. 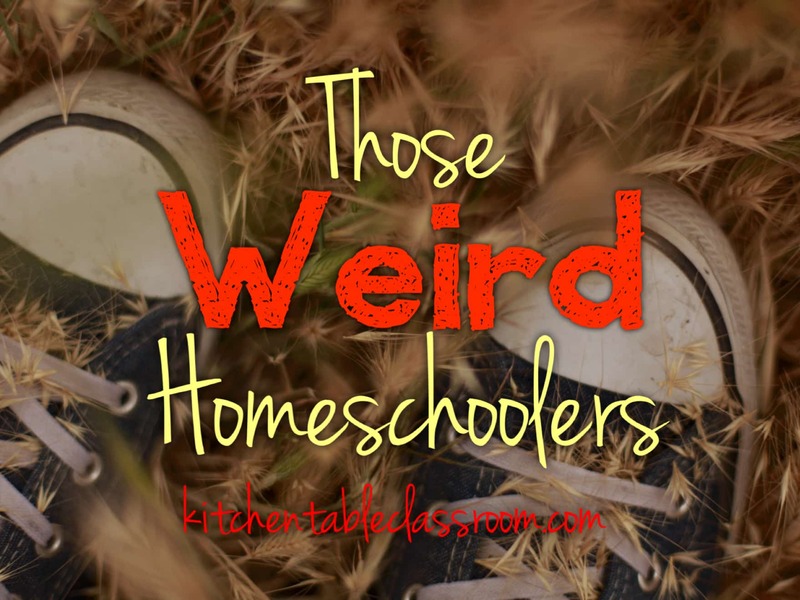 Once upon time our family joked about weird homeschoolers. When my kids complained too much about public school I teasingly offered to keep them home with me and teach them at the kitchen table. Just the two of us, all day, every day, I would say. Doesn’t that sound like fun? Well, now we are the weird homeschoolers. Chalk it up to one more thing I said I would never do, back before we had actual children. Acquaintances and the public at large have had a mostly positive reaction to our lifestyle change, not that it really mattered. But, that’s not to say we haven’t been a few people worried that our kids will not be able to speak to people outside our family, or worse yet, that they develop a different worldview than that of their peers. Gasp. My seven year old is currently working through some nerves about attending soccer camp. Camp is run through our local rec league soccer association She won’t know everyone there because she doesn’t go to school with them Chances are she will know a girl or two and by the end of the week will know them all. Homeschool sets my kids apart a bit, and that’s okay! They are becoming great at adapting to lots of situations! Every experience my kids go into involves meeting new people, of all different ages, and being able to get along. A variety of classes and athletic events with both homeschoolers and public school kids demands that they are able to adapt to any situation. Lots of people assume we homeschool to shield our kids from the world. Homeschooling has actually given my kids freedom to try new things. Being with my kids day in and day out has given me this odd and wonderful sense of peace about sending them out into the world. They have opportunities to do things they simply wouldn’t have time for if they were in school. Sometimes those opportunities are with peers, sometimes with family or other grown ups. I am grateful my kids have time to soak up influences other than those of their peers. Are there tradeoffs to this lifestyle? You betcha. Do my kids miss certain things they would have been a part of at school? Absolutely. There were some super worthwhile experiences and some wonderful people that influenced my children everyday they were there. Sure they may miss a cultural reference or two. They are growing up with a different set of experiences. It’s worth the trade off. Someday they may walk back through the those doors and join their former classmates again. This lifestyle is not a perfect fit forever. Who knows? For now we are enjoying our time together, taking advantage of different opportunities and people, and just being weird together. Those weird kids will make awesome adults someday! I will continue to encourage my kids to go out into the world and find things they are on fire for. I will encourage them to do new, hard things. Those weird interests and quirky ideas that they now have time to explore are what will make them awesome grown ups some day. Not being under the thumb of peer pressure and social expectations allow them the freedom to figure this stuff out now. I hope they can really sink into their weirdness, allow their gifts to flourish, and see how they can bless them and those around them. Teaching my kids to be themselves, on their own terms, no apologies.